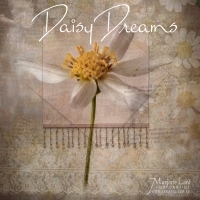 Daisy Dreams – The Story My idea was about the struggles of loves lost through war, and long distances etc. I was particularly thinking about the struggles of our parents generations when religion and judgement of out of wedlock children were so shameful. So the words were meant to represent a common phrase said to a woman left waiting & waiting in hope. So with the Vietnam war in mind where many women took on the role of wife, had babies with the promise “I will….” but the promise mostly never happened. The man in the window is meant to represent loneliness and isolation and looking out and wondering . A daisies meaning is innocence & purity, symbolizing motherhood and childbirth.